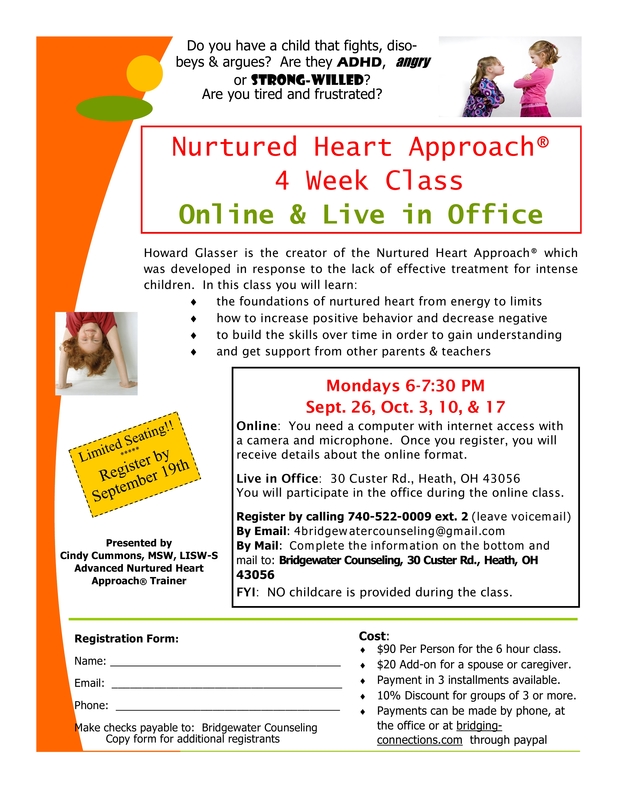 Our next Nurtured Heart Approach Class will run Mondays starting September 26, 2016 from 6:00 pm to 7:30 pm either online or live at our office at 30 Custer Rd Heath, OH 43056. To Register: click “Contact” at the top of this page, and complete the “Send Us a Message” form, including your information and the names of those attending. You may also send us any questions you have on this workshop, or on the Nurtured Heart Approach. To Pay for the Class: Visit the “Make a Payment” tab and complete the information, marking the payment for a Nurtured Heart Workshop. © Copyright 2019 Bridging Connections. All rights reserved.